Buy Online Now! 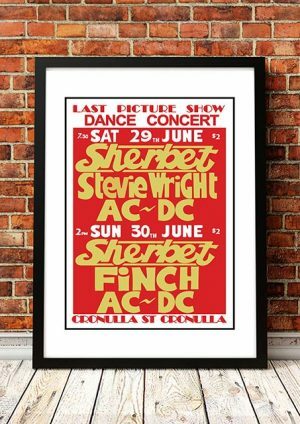 Classic Finch Concert Posters and Memorabilia. Finch were an Australian hard pub rock band, initially forming as Stillwater in 1972. The group released their first single, “And She Sings”, in January 1974. They worked in the pub rock circuit and released a self-financed album, Thunderbird, in May 1976. Late in 1976 Finch moved to Melbourne and supported a national tour by Supernaut. Following various line up changes, the band signed to CBS / Epic Records and issued the single, “One More Time” in October. They started recording material for their second album, Nothing to Hide, in the following month. The band adopted a more hard rock style, and the next single, “Where Were You?” reached number 14 in Melbourne and number 33 in Sydney in February 1978. Nothing to Hide was produced by Peter Dawkins (Dragon) and provided a second single, the title track. 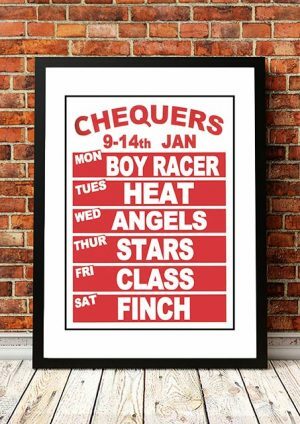 We stock some awesome Prints featuring Finch.